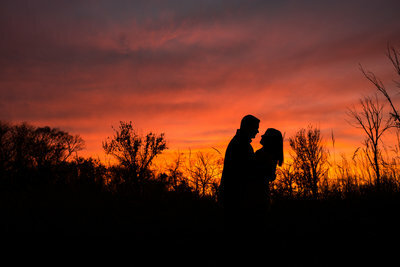 Rusty and Maggie celebrated their wedding at Eventful at Locust Grove in Weston, MO. Eventful at Locust Grove is a lovely venue tucked in the trees on the way to Weston, MO. The property is surrounded by land which provides this quiet tranquil environment. There are tall old trees protecting the property, providing shade and stunning backdrops. There is a garden that your guests will walk thru to get to the ceremony site with fountains, flowers and beautiful stone path. The reception is held in a lovely building with a huge chalkboard wall that you can have anything written on to welcome your guests. They’ve built a beautiful bar for drinks, they have a getting ready room and patio as well. Parking is also on site so no need to worry about making people drive or take a bus there. If you’re looking for a lovely venue with loads of photo options and want to have the ceremony and reception all in one location. This is a great location to check out. Let’s have fun on your wedding day too! Reach out to me here.